This guide is a kind of “Green Infrastructure 101”. It summarizes the benefits of green infrastructure (GI), including economic, educational, and health benefits. It explains how GI can be less expensive and less difficult to maintain than gray infrastructure — or landscaping strategies that don’t take ecosystem services into account. The guide argues that incorporating GI into existing parks and green spaces provides habitat and ecosystem benefits for animals and plants, while also improving aesthetics and recreational amenities for local residents. It also provides excellent pointers for how to answer common questions about GI, either from concerned residents or potential partners or investors, then lays out the steps for undertaking a pilot project, and includes case studies with examples of successful ones completed in the past. It lists additional resources, including more technical guides, and includes a checklist for imagining what GI features would work best a potential site. We recommend that this guide be incorporated into staff training and used as a tool for introducing GI concepts to interested parties. U.S. Environmental Protection Agency Office of Wetlands, Oceans, and Watersheds. 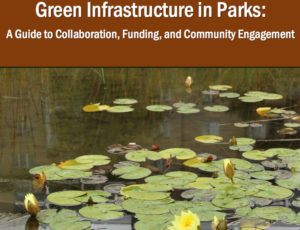 Green Infrastructure in Parks: a Guide to Collaboration, Funding, and Community Engagement. Vol. EPA-841-R-16-112. Washington, DC: USEPA, May 2017.